This month in my column for Texas Wildlife magazine I featured three talented Texas women who turn trophies into beautiful pieces of art. 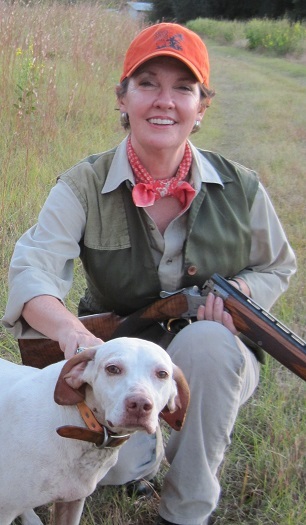 Today I am featuring Rita Schimpff with Heritage Game Mounts! 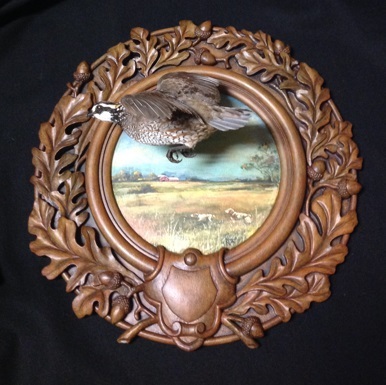 Imagine the taxidermy mounts, tartan fabrics, and oil paintings you might see in a Scottish highlands castle–now, combine that image with Texas’ whitetail deer, bobwhite quail, ducks, and thornbrush. This is the one-of-a-kind artwork Rita Schimpff is known for, and it stands out from traditional taxidermy. 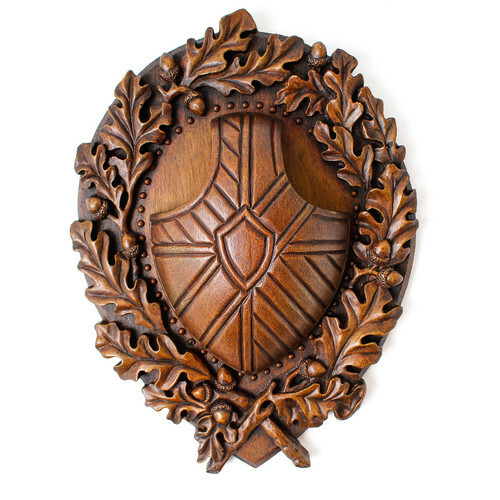 Schimpff’s designs include hand-carved oak leaves and acorns, tartan fabrics milled in Scotland, and hand painted landscapes and wildlife reminiscent of old world hunting scenes. To make it even more personal, your own ranch brands or fabrics can be incorporated. Here is my interview with the wonderful and talented Rita Schimpff! I make elegant antler display panels for exotic and domestic game to be displayed in old world style mountings popular in European Hunting Lodges of the past. 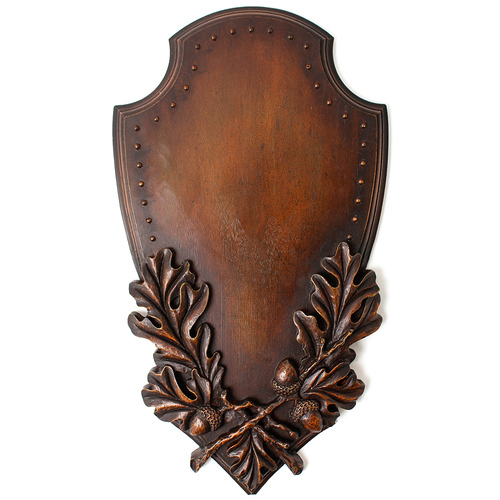 My panels are handcrafted here in the USA and designed by me, with deep relief oak leaves and acorns to be used with either the client’s antlers or from my collections of vintage antlers. The panels come in several finishes and can be custom painted. I also paint and represent lines of sporting art and accessories. What inspired you to start making this art? I was inspired by family sporting heirlooms and necessity. Our shoulder mount whitetail did not stand out over the fireplace of our new home. I had long admired the antique Swiss carvings called Brienzerware, but could not find one large enough or that did not cost an arm and a leg, so I created my own! We also have a German Charivari, made of tiny sterling oak leaves and acorns that hunters wore on lederhosen to symbolize a successful hunt. These pieces started the creative process. I continue to derive inspiration from our collection of sporting memorabilia, as well as the Victorian fascination with flora and fauna and their creative ways of display and taxidermy. What is your most popular design? It is a tie between the Monogram Legacy and Tartan Legacy. 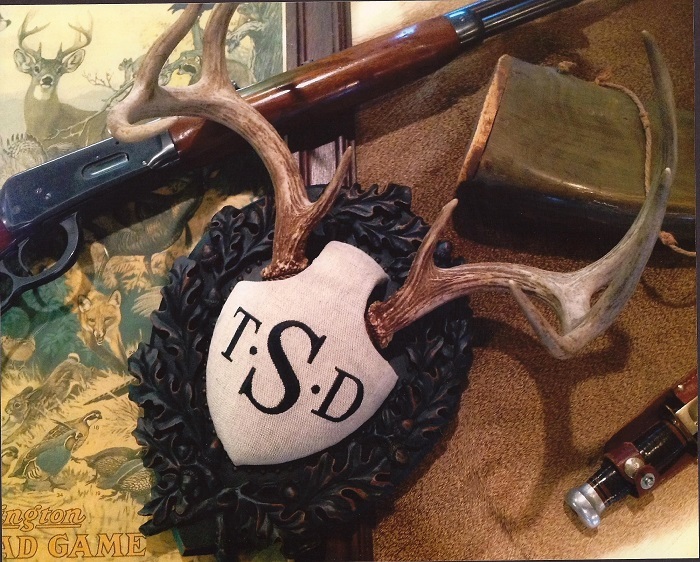 They make statements as wedding gifts, board gifts, a memorable hunt, ranch warming or to honor a first trophy. I incorporate a beautiful line of tartans that are milled in Scotland by one of my favorite designers and many times people supply or have me find their family tartan. How long have you been making Heritage Game Mounts? I started my company in 2010 – but I have studied art since I was 10. I graduated from TCU with a BFA in Commercial Art and a minor in textile design and printing. I studied Tromp L’oeil, marble and stone finishes at the Day Studio in San Francisco and all the while continued to paint & draw wildlife. What has been the most interesting piece you have done? I painted an upland scene on my largest panel and placed a mounted flushing bobwhite quail lifting off the panel. A lady wanted it as a surprise for her husband and we decided to incorporate their Brittany spaniels. The pups are long gone, and held a special place in the family. What inspired your love of wildlife and the outdoors? My love of wildlife and outdoor pursuits started very young, I was lucky that both sets of grandparents had beautiful farms near San Antonio. I turned the sheep into pets, rode horses, helped with the cattle and learned to drive standard on an old Ford pickup. And shot my first deer there when I was 10. Do you like to hunt and if so, what is your favorite thing to hunt and why? 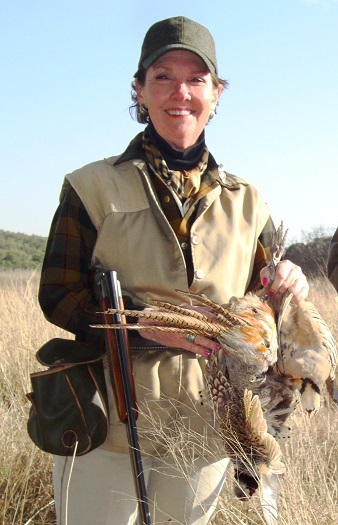 These days our passion centers around dove, upland game birds and salt and fresh water fly fishing. I got an IGFA super grand slam on trout last summer with my grandfather’s antique bamboo fly rod and reel. This January I caught my largest redfish on the fly—22 pounds! How can people can purchase a Heritage Game Mount? 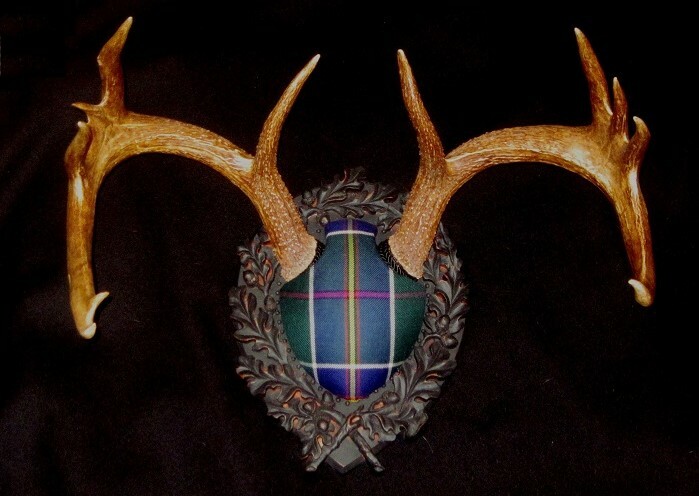 You can purchase the panels by themselves or with installed antlers ready to hang, through my website https://HeritageGameMounts.com or visit my home by appointment. Garden & Gun Magazine also carries them in their online Mercantile. 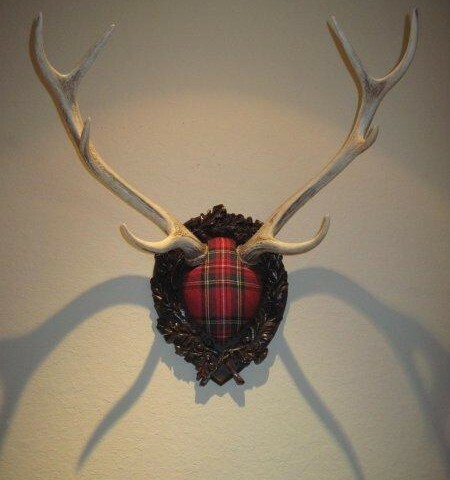 Can people send in their own antlers to be custom made, and if so, how do they do that? Yes, people send or drop off their processed antlers. Often they bring their own fabrics or Ranch Brands to incorporate in a design. I do a number of private shows in Texas each year, along with Christmas in Cowtown in Ft.Worth, Houston Safari Club and special fundraising events at Joshua Creek Ranch and Houston Gun Club-Targets for Tourette’s. Thank you Rita for sharing your story with us. I loved learning about the European traditions that inspire you! Keep up the good work. 2 Replies to "Heritage Game Mounts with Rita Schimpff"
Whit, I love reading about an art I never really knew of before! I guess I’m a “traditionalist” – I prefer these to the Annlyn Osborn ones I read about earlier,though hers are quite “spectacular” , and I love their colorful additions. Whit, I love reading about an art I never really knew of before! I guess I’m a “traditionalist” – I prefer these to the Annlyn Osborn ones I read about earlier though they are spectacular in a different way!